The preschool application process for kids three to five is quite an eye opener for many parents. If you’re like me, you had no idea that getting your child into her first preschool program could be just about as involved as applying to college. Enjoy this updated article about how to afford tuition more easily. In many areas, the demand for preschool outpaces supply, so it pays to start your research early. I’ve heard stories of some parents putting their children on the preschool waiting list before they were born! Hopefully things won’t be so extreme in your town. Still, it’s smart to start researching preschools a year ahead and plan on touring schools and submitting applications at the beginning of the year in which you’d like your child to start. Most schools offer open houses and enrollment periods as early as January. Accompanying the question of how to get your child into a good program (for most of us anyway), is the equally important consideration of how you’ll afford it. It’s no wonder parents have a hard time. Preschool tuition costs generally run anywhere from about $250 to $1000 per month. That’s $3000 to $12,000 a year. Yikes! That price varies wildly according to your region, the type of preschool and the number of hours per week your child will attend. Some types of childcare tend to be more affordable than others. Church-based preschools are some of the most affordable schools around. Whereas a local Montessori school in my area charged around $1000 a month, the church-based school we loved charged less than $300. Co-ops tend to be more affordable, too, but require a time commitment from parents. Even if your school’s not a co-op, see if you can work off a portion of your tuition by spending a few hours per week at the school. The cost of full time care for a pre-K kiddo in my state (Georgia) is around $500 a month. You can find out average childcare expenses in your state here (.pdf) Note: The cost may be more manageable if you can pay in installments. Look for a school that lets you pay monthly rather than asking for a year’s tuition up front or in two payments. Schools are pretty upfront about how much they charge. Still, there are a few crucial questions you should ask potential schools before you make any committments. They’ll help you avoid sticker shock later. Ask about scholarships and tuition assistance. Ask if you can get a discount when you enroll more than one child at a time. Ask about activity and materials fees and any other fees beyond tuition that you’ll be asked to pay. When my son was around 3 or 4 he started spending lots of time outside on his knees–playing in the sandbox, dirt, etc. Needless (kneedless?) to say, the knees of his pants didn’t even have a chance. They were getting holes waaaay before he outgrew them. Oh the money we could have saved if I had known about these cute and creative monster knee patch ideas. When I saw them on Pinterest, I just had to share (click the images to go to see them on Pinterest and find links to tutorials). And these are cute, too! How about you? Do you patch the knees of your kids’ clothes? What’s your most creative idea? We’re less than 30 days from the launch of my first book, The Baby Cheapskate Guide to Bargains. Huzzah! During April I’ll be publishing a series of excerpts in an effort to get YOU just as excited about it as I am. The first one, below, offers tips on saving on baby stuff through creating a registry. I hope you enjoy it! My very best tip for creating a registry is to focus on the items on the “need” list you created based on the tips in the last chapter. Especially important to include on your registry are items that you don’t think you’ll be getting for free or purchasing secondhand. That includes things like car seats, along with diapers, wipes, and other not-so-glamorous items. A case (or five) of diapers may not have the same “Awwwwww” factor as a tiny pink dress, buy you’ll be glad later to have the diapers. By registering for essentials, you won’t be stuck handing over money for items you can’t live without while you have a closetful of adorable newborn clothes that will be outgrown in two weeks and rattles that your baby may or may not ever give a shake about. Skip the War and Peace–sized registry checklists offered by retailers. They’re packed with nonessentials. If you’re not into scouting for secondhand items, consider adding some of these popular big-ticket extras, like strollers, to your registry so that you won’t have to pay for them out of pocket later. Friends and family can go in together on items that would be too expensive otherwise. We’ll talk about these big-ticket extras—cribs, strollers, and so on—in more detail later in the book. If (and only if) you have the room to store them, it’s also helpful to register for things you’ll need a few months down the road, like a high chair. If you’re short on space, consider adding gift cards to your registry so that you can pick up gear and other items as your baby reaches the age where she can use them. Look for another excerpt next week! Want to be one of the first to get it? The book (paper and Kindle version) is available for preorder now. When you think your baby is about to get mobile, it’s time to shift into baby proofing mode. I remember the first time I saw a catalog from One Step Ahead. I was shocked at how many baby proofing gadgets are on the market. I was confused, too. Did I need all of them? Only some of them? Which ones? Exactly how much baby proofing you’ll need to do depend on your baby’s personality, your parenting style, and the particulars of your home. Some babies are real explorers, and some aren’t as adventurous. Some are climbers, and some simply aren’t. Some of us never leave our babies’ side as they play, and some of us have other things to attend to from time to time–like other kids–and can’t watch the baby every second. Above all, it’s better to be safe than sorry. Start figuring out what you’ll need to do by exploring your home on your hands and knees to get a “baby’s eye view”. That way you can identify areas and objects of concern. You’ll get an even clearer idea of what needs to be done as you watch your baby’s first attempts to explore the house. Here are eight easy, and inexpensive first steps to take to baby proof your home. I’ve linked to products at Amazon so that you can check them out. Move cleaning supplies, medicines, paints, glues, solvents and other chemicals out of baby’s reach. The same goes for sharp objects (scissors, knives, tools, etc. ), firearms, breakable objects, and some electronics. Sometimes this just means moving items from a lower cabinet or drawer to a higher one. If this isn’t practical, try cabinet and drawer locks. Your toddler will figure out how to turn a doorknob sooner than you think, so doorknob covers are pretty handy. You’ll also want to make sure windows can’t be opened. Pay special attention to the kitchen and bathroom. If the entire room is off limits, you can keep the door closed or use a baby gate. If your baby will have access to either room, don’t forget to secure your oven door, dishwasher door, fridge door, and toilet lid (some ovens and dishwashers have built-in locks). Turn down your hot water heater’s temperature to about 120 degrees F to prevent scalding–no purchase necessary. Secure bookcases, dressers, televisions and other pieces of any furniture baby can pull up on to the wall to prevent tipping. You can buy special straps that attach to the top or back of the piece and then to the wall. Cover electrical outlets to prevent insertion of little fingers and everything else. (and don’t forget about outlets in power strips). We used the inexpensive plastic pronged kind for our outlets and they worked fine for us. It’s also a great idea to throw a few extra plug-in outlet covers into your diaper bag for trips to grandma’s house, hotel rooms, etc. 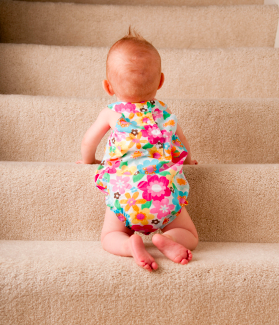 Prevent falls on stairs if you have them by installing a baby gate at the top and/or bottom of the stairs. I think simple is best. We had a fancy (and expensive) remote-controlled one and it drove us bonkers because it didn’t unlatch dependably. Consignment sales and stores are great places to find deals on baby gates (and other baby proofing items, too). Remove strangulation hazards like mini blind cords, electric cords and other dangling objects from your tot’s reach. Watch out for items like table cloths, too. If your baby pulls on them items resting on top of them can fall on her. Cover sharp edges of fireplace hearths and the edges of furniture to prevent a trip to the emergency room for stitches. You can buy foam covers and guards or you can improvise your own. We used a folded up comforter to cover the edge of our hearth. You can also cut open a pool noodle to cover the edge of a coffee table. While I can’t tell you precisely what you need to do to baby proof your home, I can say with certainty that you do NOT need to spend a mint buying every single baby proofing doodad. Let common sense and awareness be your most powerful tools. And when in doubt, remember that it’s better to be safe than sorry. Which baby products are definitely worth buying? Ask the masses! Yesterday I asked BC Facebook Fans to give me their nominations for “Best Baby Product of 2011.” Here are the ten baby products that made fans’ lives easier this year (listed more or less in order of popularity). I’ve linked to each product at Amazon so that you can find out more about it. And great news! 7 of the top 10 items below are around $50 or less. If you take a look at last year’s list of top products, you’ll see that this year’s list features some repeat performers as well as some new items. Most of us have a little experience with haggling, whether it’s buying a car or a house, or scoring some deals at a great garage sale. Did you know you can successfully haggle your way into savings at the mall and at retail stores? I’ve read lots of articles about how haggling for retail goods really works, but I guess I’m a shrinking violet because I’ve never tried it. It seems like I’m not alone. Yesterday on BC’s Facebook page I asked readers if they had tried haggling at a retail store. 58% of the folks who responded said they hadn’t tried it. But you know what? Of those who had, ALL had been successful. You’ll see a similar statistic in articles about haggling. The majority of shoppers who have the gumption to ask to ask for a better price, get one. My interest piqued, I pored over recent articles about haggling to find out how it’s done. Here’s how haggle your way into retail savings. First, understand that prices aren’t set in stone even though it may seem that way. It’s also important to realize that you’re not going to upset the salesperson or manager if you ask for a discount. As MainStreet.com contributor Matt Brownwell states in his Ultimate Guide to Haggling, “Retailers mark up a product considerably over its wholesale price, which means that even when you factor in the costs of operating a store, there’s still plenty of room for a retailer to discount an item and still turn a profit.” And that’s what salespeople and managers are there to do. They can generally still make a profit if they offer you that extra discount. And if that’s what it takes to make a sale, that’s what they’re probably going to do, says Tory Johnson at ABCNews.go.com. And what if the item you want is already on sale? Don’t think that there’s no way a store will go lower. Bob Frick of Kiplinger.com says that “Sales are signs that a price is no longer fixed.” That said, don’t expect stores to cut prices in half. Though you may get luckier, figure on saving an extra 10% to 20% off the price on the tag. Considering that shoppers spent an average of $811 on holiday purchases last year, according to Time magazine, 10% to 20%’s not chump change. Consumer Reports suggests focusing your haggling efforts late in the month when salespeople are working hard to meet sales quotas. Another great time to try is when sales are slow. During the holidays, you’ll probably have the best success if you wait until late in the season when stores start to get antsy about holiday sales. Black Friday will be too busy and the store will probably feel its discounts are low enough already. Start your negotiations with sales floor team member or salesperson. If you don’t have any luck there, go higher up. Don’t go straight over the salesperson’s head at first, however. It’s insulting to the employee and can make it harder for you to get the deal. Keep in mind, too, that Employees at small stores may have more power to change prices than those at the big chains. Be respectful and avoid negativity when dealing with store personnel. You want to seem friendly and confident (but not pushy). Don’t draw attention to your haggling efforts, says Consumer Reports. Be low key and try not to attract attention to what you’re doing. The person you’re dealing with won’t want to offer the deal to everybody in the store. Compliment the item and talk about how useful it would be to you. Tell the salesperson or manager what your budget is and see what happens. Above all, be polite. Ask when the item will go on sale. They may tell you, or discount the item by the future sale discount amount to get you to buy then. Offer to pay in cash. That’s appealing to stores because it’s a sure thing, and because they won’t have to pay fees for credit card transactions. Even if a store doesn’t advertise that they price match, it doesn’t hurt to try. Don’t tell them that’s what you want, though. Credit Karma suggests asking for the discount first, and pull out your info if you need to. Show the salesperson or manager a price you found online or at another store. Discontinued or clearance items may be easy targets for successful haggling because the store wants to get rid of them. The same is true for end-of-season items. You can probably get an extra discount on Christmas stockings, for example, right after Christmas. And a final caveat: You might have a hard time if it’s one of those stores that tries to get you to sign up for a credit card (like Macy’s or Kohl’s, for example). 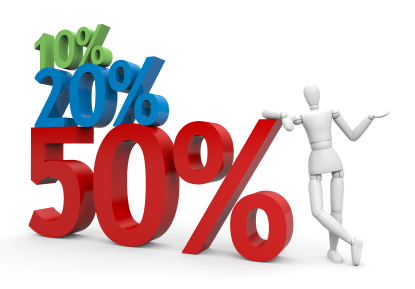 Because salespeople gain from the number of sign ups they process, they may make it a prerequisite for any discount they’re willing to offer, says MainStreet.com. So what do you think? Want to try haggling next time you go shopping? If you do, let me know how it turned out! Black Friday is coming soon. We’ve seen the ads from many of the stores, but not the big A. Curious about what toy deals Amazon offered last year? Here’s a list of some of the toy deals I posted last Black Friday weekend (in this post and this one). Remember, these are from last year. Hopefully, they’re an indicator of the deals we’ll see next week. What are some of the Amazon deals you remember from last year?